November 23, 2014 -At 13:36 the SHFD was dispatched to the intersection of West Columbia Street and Guldin Lane for a vehicle accident with entrapment. Chief 730 (Zulick) arrived on location and found a two vehicle accident with no entrapment. Fire personnel arrived on scene, secured the vehicles, assessed the patients until EMS arrived, and swept debris from the roadway. Chief 730 had command. November 8, 2014 – At 19:41 as all SHFD units were in the midst of a parade for the Midget Football Team, the SHFD was dispatched to 215 East Main Street, for a smoke condition inside of a church. Fire crews quickly arrived on scene and found an electrical issue with a light ballast. Crews disassembled the ballast, secured the source of the electricity, and used a TIC to check for possible extension. A PPV (Positive Pressure Ventilation) fan was also used to eject the smoke inside of the building. All SHFD units were on scene for approximately 1 hour. Chief 723 had command. November 8, 2014 – At 08:16 Stations 2 & 4 were dispatched to 9A Earl Stoyer Drive, in the borough (Grace Evangelical Church) to setup a landing zone for incoming Medevac 7. Fire personnel arrived on scene and established a secure area for the helicopter to land. After a safe landing, SCCC advised that the flight was cancelled, and Medevac 7 returned to the air. All units cleared the scene. Chief 724 was in command. November 6, 2014 – At 19:52 the Schuylkill Haven Rapid Intervention Team was dispatched to 143 Schubert Road, Upper Tulpehocken Township, Berks County for a reported house fire. Berks Deputy Chief 50 arrived on scene and found a controlled burn. All SHFD units were then placed available. November 4, 2014 – At: 20:02 Stations 2 & 4 were requested by Chief 720 to assist on a smoke investigation in the area of West Adamsdale Road and Briar Road, North Manheim Township. Chief 722 (Motko) also assisted on the call and advised of a heavy smoke condition near the Nutty Pear Restaurant. Engine 737 arrived on scene and discovered a controlled burn. Engine 732 also searched adjacent areas near the Schuylkill Memorial Cemetery and Route 61 and found a small trash fire. Both fires were extinguished and all units cleared the scenes. November 4, 2014 -At 18:48 Stations 1 and 4 were dispatched along with Fire Districts 39, 42, and 47 to 1104 Berne Drive, South Manheim Township for smoke in a house. As all units became en-route Chief 39 advised of a light smoke condition inside and residence and held the call to District 39 units. All other units were then placed available. November 4, 2014 – At 13:24 Station 4 was requested to 2248 Panther Valley Road, Wayne Township for a working house fire. Engine 737 and Tanker 738 responded to the call. Initial reports from the scene suggest the bulk of the fire has been knocked down and contained to a few rooms. More details will be provided shortly. 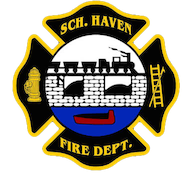 November 2, 2014 -At 14:41 the Schuylkill Haven Fire Department was dispatched to 90 Seven Stars Road, North Manheim Township for a house fire. Chief 730 (Zulick) arrived on scene to find a working house fire, with the surrounding brush on fire. Ladder 725 and Engine 737 were the next arriving units and their crews initiated fire attack. Due to the driveway being extremely narrow, other units staged near the hydrant (at the bottom of the driveway) and sent their manpower up to the scene. Tanker 738 eventually made the 2600ft trek through the trees to provide additional water. Both Engine 737 and Ladder 725 sustained minor damage to their apparatus due to the tight tree line. Chief 730 had command, and Pottsville RIT was also dispatched to the scene. November 1, 2014 – At 11:20 the Schuylkill Haven Fire Department was dispatched to 300 East Liberty Street, the Schuylkill Haven Casket Factory for a building fire. Chief 730 (Zulick) arrived on scene and found smoke coming from the eaves of the boiler room and confirmed a working fire with the sprinkler system activated. First in Engine 737 deployed a 2 1/2 attack line and made entry into the boiler room. The next arriving unit Engine 732, tagged the hydrant located above the first entrance to the parking lot and established a water supply to Engine 737. Ladder 725 positioned on Side A of the boiler room and the Ladder crew began to ventilate the roof. The fire was knocked down within the first 10 minutes. Fire personnel remained on scene for approximately 1 hour, checking for extension and dousing hotspots. Chief 730 (Zulick) command. Pottsville RIT also responded to the scene. Photos via MLK Photography. October 31, 2014 – At 15:25 Stations 1 & 4 were dispatched along with Fire Districts 56, 42, and 47 to 1044 Centre Turnpike West Brunswick Township, the Fort Motel for a structure fire. Chief 56-01 arrived on scene and and was met with heavy fire showing from the rear of the motel and immediately requested a tanker task force. Crews from Engine 737 and the Orwigsburg FD arrived on scene and initiated an aggressive interior attack. Ladder 725 setup on the address side of the building and began roof operations. A tanker shuttle was setup and a water supply was established from the pond located in front of the Lighthouse Church. Due to conditions deteriorating rapidly and the fire intensifying Chief 56-01 requested the Schuylkill Hose and Ladder 51 from the city for additional manpower. All operations then switched to defensive.Once the bulk of the fire was knocked down from the exterior, crews were able to continue the interior attack, ultimately extinguishing the fire. The fire was brought under control within 2 hours. Photos from MLK Photography.